Congratulations to all Triton teammates racing at the Treasure State Triathlon and Ironman Coeur d’Alene! For now, here are the Triton race result summaries. A separate race report or two are in the works. If you have content or would like to make a contribution, please let me know. Better yet, just add your comments by clicking the comment link for this post below. Looks like Dan Martin already has the thread rolling. What an amazing weekend, and for me, a supremely satisfying one. Likely more later. Train on, Race on! CONGRATS TO TRITONS QUALIFYING FOR USA TRIATHLON NATIONAL CHAMPIONSHIPS! 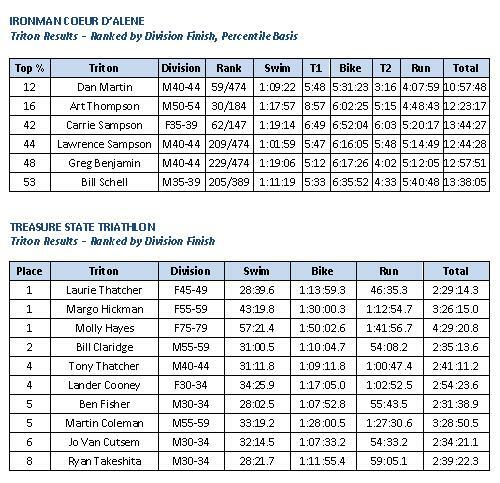 Dan Martin & Art Thompson met the qualifying time standards for the USA Long Course Triathlon National Championship. The event will be held on October 2 in Myrtle Beach, South Carolina. The Championship is the sole qualifying event for the 2011 ITU Long Course World Championships in Las Vegas on November 5, 2011. The top 20 finishers in each age group at the National Championship qualify to represent Team USA at the 2011 World Championships. For finishing first in their age group, Laurie Thatcher, Margo Hickman, and Molly Hayes qualified for USA Triathlon National Championships. The event will be held on September 25 in Tuscaloosa, Alabama. The Championship qualifies athletes for the 2011 ITU World Championships in Beijing, China. Slots on Team USA will be available to the top 18 finishers per age group, with slots rolling down to 25th place. It’s funny how an event like an Ironman brings it all back into perspective. Most of us started the past year planning for the moment, addressing goals, and some of you even trained quite well. The bars were set pretty high to begin with. You go into the race thinking that you are going to be disappointed if you don’t reach those goals. But once the big cannon goes off and you start lounging into the water like a bunch of walrus, kicking, prodding, and poking your way through the herd, you realize that it’s going to be a long day. There will be some pretty high highs, and some pretty low lows. The fact that there’s a possibility that you CAN finish the race is saying more than 99.9% of the world’s population can say they can do in a 17 hour period. You realize your goals are fairly meaningless because your body & environment are going to dictate IF you are going to finish. About mile 6 of the run was when things really started to slow down for me, and the rest of the run was an epic battle between cramps, “normal” pain of doing 120 miles of work, and just grinding it out. Doug rode along side of me from time to time shouting encouraging words along the way. I got to the second to last aid station where I saw Julie. What a welcomed surprise, and she was so positive! It really motivated me to move a little faster. On my way back in, I started to see all the Tritons come through. Lawrence was looking strong on the run. Then I saw Greg who was looking decent. Art came next and looked like “Bob” from the Enzyte commercials. Just happy to be alive and knowing that things were going well. Finally, there was Carrie who was still positive and looking pretty strong herself. It was all encouraging to see. Needless to say, what seems easy when you are projecting ahead becomes a little more difficult as the year goes along. I’d blame it on the kids or my wife because they distract me from training, but I kind of welcome the distraction. Work, sleep, etc… all get in the way of Ironman training. Oh, and then I made a few workouts as well. Made some good friends who made me meet them at the gym when I did not feel like it. Or I spent an hour more on the bike than I wanted to so I could finish a conversation with them. Shared some stories along the way, had quite a few laughs, and got in pretty good shape. …Let’s see. I had the support of 11 family and friends who specifically came to the race to support me. I got to spend some time relaxing before the race with some of my Triton friends who were very gracious the whole weekend. After suffering for about two hours, I ran the second to last half a mile with one of my dearest friends on a bike, and our coach running beside me encouraging me. I got to see Lawrence PB the course after doing a few of these, Greg just grind through getting it done against all odds the way he was feeling, Art finished with such immense satisfaction, and did Carrie actually beat her previous time by an hour? Holy crap! Disappointed? Wouldn’t trade it for the world. Thanks for being a part of it and helping me accomplish the goals that really matter.